Denair Football Team Wins State Championship! Submitted by Denair High School. Decades from now, after the legend of this year’s Denair High football team has been passed down from one generation to the next, the people who know the story best – the players and their coaches – no doubt will remember this: this special season was possible because each of them believed in the other without reservation. It was a team without apparent ego, everyone willing to sacrifice a little of himself for the greater good. 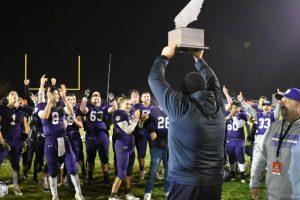 Saturday night, with purple-clad parents and students and proud alums, gathered to watch on a chilly night at Jack Lytton Stadium, Denair capped a dream season with a dominating 42-14 victory over Santee of Los Angeles for the California Division VII title. The Denair Coyotes are state champions. Sunday morning – after maybe four hours of sleep – it still hadn’t quite sunk in for Coach Anthony Armas. The title game against the best team from Southern California followed a familiar script: the Coyotes jumped out to an early lead, used their stable of multi-talented running backs to keep Santee’s defense on its heels and its offense off the field, and made enough big plays of their own on defense to ground the Falcons. Denair (12-1) scored touchdowns six of the nine times it had the ball. It ran out the clock to end each half and turned the ball over just once on a fumble on a field slickened by rain earlier in the day. That the Coyotes controlled the game minus one of their main offensive weapons – running back Hunter Musgrave, out with a neck injury – reflected the team ethos Armas has preached since practice began July 23. “Do what we do and do it well. Play fast,” is what he told them before the game. Drew Pritchard – filling in for Musgrave – ran for 123 yards and two TDs, and Steffin Winston added 120 yards and two more scores to lead the Coyotes’ offense. Denair led 28-6 at halftime and never was threatened in the final two quarters, despite facing the nation’s leading rusher in Santee’s Joseph Todd. He finished with 251 yards on 30 carries, and scored both the Falcons’ touchdowns on long runs, but mostly was kept in check by the swarming Denair defense. By the fourth quarter, with Denair comfortably ahead and the outcome assured, the excitement and anticipation were amplified. More than 1,000 fans were screaming in Denair’s grandstands; others cheered from the warmth of their cars looking through the chain-link fence off Lester Road. “I saw former teachers and alums I had coached,” Allen said. At that point, Allen’s biggest concern was making sure he got the state championship trophy – which had arrived earlier in the week – to the postgame ceremony at the middle of the field. It was then that the community celebration – which eventually made its way to the Pizza Factory – truly began. Armas, a 1997 Denair graduate who took over a program four years ago that previously struggled to win a few games a season, accepted the handshakes and hugs and congratulations. Later, he and his assistant coaches gathered at one of their homes, as they do after every game, to review what happened. “We hang out and just try to decompress. We talked about the game and season as a whole,” Armas said. What will he remember about this once-in-a-lifetime group of players? “This team is the definition of special,” Armas said. “I always thought we had a special group of kids. The way they work together. They care about each other. We talk about family and that’s what they are. By the time he finally got to bed about 1:30 Sunday morning, the magnitude of being state champions had just begun to sink in for Armas. Leave it to Allen – who grew up in Denair, graduated from the high school in 1985, and has witnessed firsthand all the highs and lows the town has experienced – to provide some perspective. “During my lifetime, this is the biggest thing to happen to our community and to our school,” he said. In Allen’s office, there are pictures of every football team dating back to the ’80s. Saturday night, after the last players and coaches and fans had left the stadium, Allen was alone with the state championship trophy in his office. He already had received more than 75 congratulatory texts and emails, but his mind was on everyone who ever had worn a purple Coyotes uniform. Allen, reflecting Sunday morning, credited this year’s players for never allowing any moment to become too big for them – even a state championship game.